The biggest (and most relatable) geek in the Marvel Universe, Spider-Man is back and he’s hitting our screens in a movie that’s gonna help us forget about Spider-Man 3. Hoodies serve so much purpose when it’s too chilly to go outside in a t-shirt, so we figured we’d combine these two things, share some of the coolest Spiderman hoodies on the… web. Imagine him ditching his aunt and uncle and too busy caring about coffee and the other Mary Jane to be a successful superhero. It's tough out here for millennials and while Spidey is now probably whatever generation came after us, I can see him being the type of dude to try too hard to fit in too late. And then not care. When you've shared a screen with James Franco in one of your lifetimes, you get free reign to do as you wish. PLUS, as a hipster, there's no shame in wearing a Spiderman hoodie even if you are Spiderman. Oh, the cinematic mistakes we made before movies were most commonly franchises that cost millions to make. The turn of the century saw "nu-metal" bands take over. It also saw the unexpectedly bizarre rise of Nickelback - one of the Internet's greatest triggers. While I don't exactly remember the song, I remember the video and how cool it was to see Spidey swinging from building to building. You have to think that this was the era of the PlayStation 2. Graphics were good but not as good as now. That visual was AWESOME. And so is this Spiderman hoodie. Soon to be not so secretly, we love Venom here at Discover Geek. Name one superhero or villain that has a more disturbing vibe than him. I'm giving you a day to think about it 'cause you still won't. Anyway, costume style geek hoodies are such a big thing these days that there are a bunch of superhero ones, Spidey and Venom included. Zip the hood up far enough to cover your whole face. I've still yet to work out the benefits of doing this but, hey. At the very least, it looks cool. It's a natural progression to feature the companion Spiderman hoodie to the Venom one. Both of them have full masks, both of them leave a lot to be explained for me, and both of them are fricken cool. You'll be cool in them too, just not cold. The difference between these lies not only in feeling but in actual physicality. You can be cool at any temperature, but you can only be cold when you're standing in front of Arnold Schwarzenegger's Mr. Ice. Some people -- looking at you Agent Fox Mulder, Giorgio A. Tsoukalos, and also myself -- want to believe in aliens. Others, like the majority of Stan Lee lovers and Batman movie geeks out there, want to believe in superheroes. Superheroes do exist though. So do supervillains. You just have to read something on the internet or see something on the news to see that! This Spiderman hoodie is a funny cross between the Spiderman franchise and The X Files (one of my favorites ever) which means you need it or you'll never see Scully roll her eyes. 6. Save a Life and Get a Churro, What’s There to Lose? After a hipster stint of living in Greenpoint and listening to Bon Iver's greatest hits from the one album anyone remembers, Peter Parker has returned to his rightful home of Queens to serve and protect its people. He's been stopping crime and being bought churros by old ladies after the fact. Ha! And people wonder what's in it for superheroes or what they get out of it. Sugary goodness if you're Spidey, I think you'll find. They have nothing to lose and everything to gain. And also lycra, like some of these superhero compression shirts. It isn't only memorable because it's a spider, either. Spider-Man is one of the best-loved and most popular superheroes spanning across both comics. He's the one everybody can identify with, though the last time I held a tarantula I can safely say she just sat in the palm of my hand calmly. What's a girl to do to get bitten by an arachnid to start sprouting webs from her hands? I want to swing from Stark Enterprises to the Empire State Building. The logo also looks hella-rad on Spiderman hoodies. Almost. Let's be clear on this. Fridays are awesome. One might argue they're the best night of the week because it comes before the real best night and is not the best, meaning it's still in the future to have. [DEEP BREATH] So yeah, we love Fridays about the same amount as we love Spidey, but since Spider-Man Homecoming is coming out, it's gonna be pretty easy to be distracted from something that happens once a week for a couple of them. And hey, if you love both, just go see it on a Friday. 9. Who Cares About Yale When You Can Go to Midtown (and Be Bitten By an Arachnid)? Show your smarts in a Spiderman hoodie that will put anyone's Yale or Harvard hoodies to shame. All the best scientists went to the school Peter Parker goes to (at one point, Kitty Pryde too). Scientists like Einstein and Tesla wanted to attend and couldn't, being that they were in a universe they call "Reality". This one is just a nice little hoodie that calls to Spiderman without the hood covering your eyes or nose; one you can wear to work or school super easily. Beetlejuice! Beetlejuice! Bee-- hang on, we all know what happens if I complete that sentence. Let's stay chill for a while since it's in Peter Parker's best interests that he concentrate on his homework rather than the bio-living exorcist who's been brought into the world of the living by an emo with a camera. (And no, I don't mean Dark Spider-Man in the third movie). We'll just sit in the Winchester, get a pint, and wait for it all to blow over. You know that feeling when you're outside in a hoodie and it ends up being so warm you have to roll up your sleeves because, if you take it off, your body will be cold? That's one of the reasons sleeveless hoodies were invented and this sleeveless Spiderman hoodie takes that idea and makes it a thousand times cooler, literally just with the addition of the Spiderman logo. That's some power. Not a bad person to have on your team, although I'm not sure this counts as good skating if he's supporting himself with his webs and, the same way, can save himself from any falls or trips. What do you think? Regardless of that, I think this is the perfect Spiderman hoodie for skating. It's lightweight so you won't sweat and the novelty is too much for my geek self to handle without saying, "YAAS." 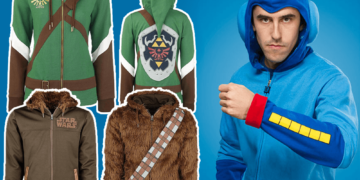 For more awesome hoodies for the cold weather, check out these galaxy hoodies, Kingdom Hearts hoodies, Assassins Creed hoodies, and Green Arrow hoodies.